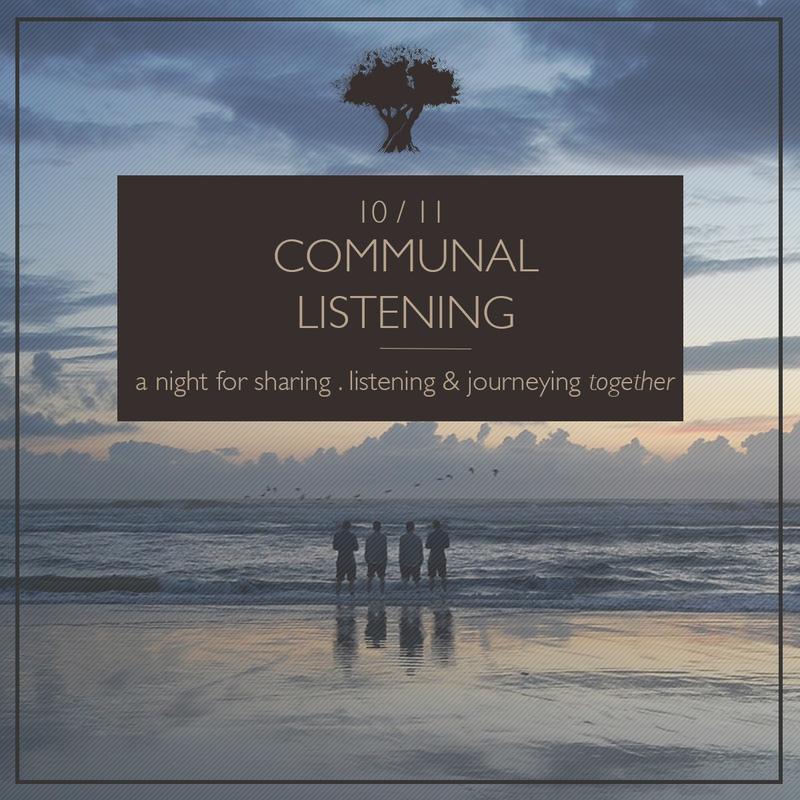 So last Sunday night The Practice tried something a little different from our typical service, and invited our community to experiment with a night of communal listening. John opened our time together by naming what was true, that for some of us, drawing close to share ourselves in community is an exciting invitation, and for others – it can be really scary and hard! I wanted to go around the room and high five everyone who took the risk to be with us and try out this experiment of listening and sharing what God has been doing in our lives. Like John shared, one of the main heartbeats of why this night came about – was the huge realization that we cannot, and should not, walk this spiritual journey alone. Our team has reflected a number of times that whilst we do a lot of things at The Practice communally, like reading aloud together and practicing together, there is a big difference between participating in a communal exercise and actually being in community with one another. After John shared the vision, we kicked off our opening liturgy a little differently by passing the peace of Christ to one another right at the beginning of the service – for me this set the tone for the rest of the evening, as I offered peace, shook hands, and gave hugs to those around me, I had a sense of joy that I would shortly be able to sit a while longer with some of these faces, with whom I do communal things all the time, but who I would love to know personally in community. It allowed us to center on God’s presence and remember that He is at the heart of what and why we share. I love the juxtaposition of practicing silence before sharing because it settles and sifts through the ‘inner noise’ that so often tumbles out of me without a filter so I can be present and connected to what God is saying. It allowed anyone in the room who had not yet practiced silence, to have a taste of how wonderful and messy this practice is. This way even new visitors were invited into the rhythms we’ve been teaching so that they could share and participate in sharing on what had just happened. Then after this time of silence – the magic really happened. Our facilitators stood up and we self organized into groups of 6-8 around each facilitator to begin our time of communal listening. Our rhythm was simple yet effective, John asked us all a question from the front, we all spent 1 minute in silence to reflect upon it, then we shared for 10 minutes with one another our thoughts and responses. And waow – for a bunch of introverts – the room certainly came alive with conversation, sharing and vulnerability. I was so touched and encouraged by the depths of sharing I experienced in my own group. As we shared similar struggles, joys, and invitations from God, I felt it deep in my soul, I am not alone. We are in this together. How has silence played a role in your life? What are the obstacles that keep you from practicing silence? What is one next step you sense God is inviting you to explore? At the end of our discussions, John opened up space for us the various groups to share with the whole room, any themes or commonalities that stood out – and it was such a comfort to hear the common threads that seemed to be running through many of our discussions. We heard that technology, social media & emails are a constant distraction, vying for our time. We heard that the constant need to be productive is hard to fight. We heard that silence, grants peace, perspective and joy in the midst of life’s noise. It was beautiful, honest, messy community. From there we approached the table for Eucharist – confessing our sins together, receiving full assurance of our forgiveness, and finally accepting and receiving the body and blood of Christ together. I love that no matter how experimental each week gets – ultimately our gathering revolves and centers around the table. We all got to share in the same body and blood of Christ together, being united in what Christ has done and is doing in our midst. It was the perfect testimony to the community we had just experienced. As we closed in song, and Aaron invited us into Kingdom Practices – to take this sense of togetherness out with us into the world, to be ever reminded that we don’t have to do this alone – I was so filled up with joy and pride for our community. We did it! We tried it! We sat across from one another and fumbled with words and thoughts to bare our messy, beautiful souls to one another and we not only survived, we thrived. I am excited for the seeds that are sown through these nights, I am hopeful for the connections we made that can flourish into deeper community, and I am grateful for the risk each person took to experiment in this way. If you are nervous about participating in nights like these, I’d love you to receive the reassurance that community is always messy, but so deeply worth the initial risk and uncomfortability. You may worry that you have nothing to contribute, or too much to contribute, but I promise you your very presence matters and ministers to the group. Showing up may be the hardest part – but we certainly hope to keep creating safe containers in which you can both know others and be known. During our benediction, I asked each person to hold one hand out to receive the benediction, and to place one hand on the shoulder of someone in their group or someone they were standing beside. A symbol of both receiving, and blessing. As I read the simple blessing over the room I encouraged everyone to turn to one another at the end and repeat my words, “Go in peace,” to each other. It was a holy space for me to see us bound together in that moment. So now, I share these words of benediction and blessing to you again, with the hope that you will carry them throughout the next two weeks, until we meet again, in the knowledge that you are not alone, we are in this with you. May we practice and pursue the gift of silence, and in so doing encounter the whispers of God. Now go in peace, my friend. Go in peace.